Leading NHS skincare scientists, dissatisfied with moisturisers generally available, developed and tested a sunflower formula to provide better care for skin. High grade natural sunflower oil was chosen as the primary ingredient because it is rich in linoleic acid that has many beneficial properties for healthy skin. A joint venture was initiated between the Plastics and Burns departments at SDH to support and improve the rehabilitation of newly healing skin. Patients with burns, median sternotomy, breast reduction and scarring through other surgery, were referred to the Tissue Support Clinic. Here, clinicians would advise patients on keeping skin hydrated, protect newly healing skin and provide treatment to help avoid contracture. Some bowel surgery patients internationally were recognised as suffering from an Essential Fatty Acids (EFA) deficiency because they could not absorb enough EFA's from the remaining bowel. These patients showed poor skin quality and a decreased skin barrier protection, making their skin very dry and itchy. This was also associated with a lack of EFA's in those ceramides, believed to be responsible for maintaining the barrier function of the skin. The situation could be rectified by a topical application of high grade sunflower oil, a rich source of EFA's. The newly established epidermis (skin over scars) is thin, pale and fragile and it was shown there were low levels of EFA's (Linoleic Acid) within the ceramides. 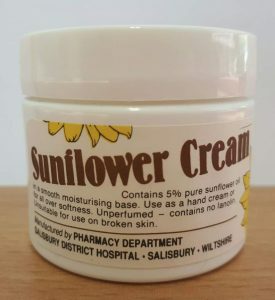 In an attempt to improve the quality of the newly established skin, a water based cream containing sunflower oil, was produced by the Salisbury District Hospital (SDH) pharmacy and supplied to patients. By 1983, monitoring reports showed that patients believed physical care of their scars was easier, that scar appearance was improved and itching often stopped when the cream was applied. Patient feedback suggested they had all found the formula to be a valuable part of their rehabilitation skincare on their scars / wounds. Increased patient satisfaction resulted in the formula becoming their preferred moisturiser, leading to the cream being supplied on a routine clinical basis. From 1984-1990 the water based formula was routinely made up in the SDH pharmacy in simple white pots. The increased awareness of the effectiveness of this cream created additional demand on the pharmacy from non-patients to help with dry itchy skin. A charge was levied and the promotion of the product began in a small way. At the same time, the Daily Mail was conducting a study of 'Rip off Skincare' and the sunflower cream featured as an ethical and affordable moisturiser. Further promotion followed as the story was picked up by other papers and was featured by Esther Rantzen on 'That's Life'. Through 1992-2012 demand grew and sales steadily increased. . 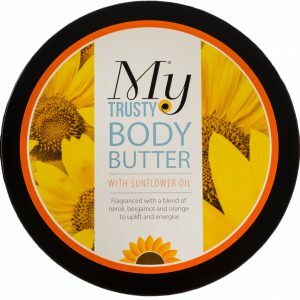 The Trust decided to commercialise the cream, leading to the creation of a team to help develop the brand - these were known as the ‘My Trusty Testers’. 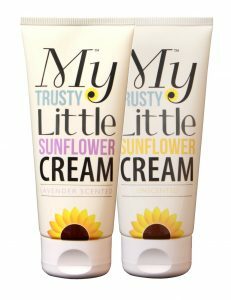 The sunflower cream formula became known as My Trusty Little Sunflower Cream ... because that was exactly what it was! Starting with an unscented and a lavender formula, two 100ml tubes were manufactured by an external company. Sales rose significantly, and a 250ml pump was introduced. The brand had has unique selling points: -NHS owned and developed -All profits reinvested back into patient care -NHS researched and developed to address perceived deficiencies in the functionality of skin. Based on the knowledge and research of clinical innovation manager Carol Read RN/MSc, the brand range was extended from just the original cream. Carol was the clinical innovator of a richer body butter and a face & body oil, which were introduced to form a skincare range that would appeal to a broader consumer base, and improve the brands commercial potential. The brand had won eight prestigious skincare awards. However, feedback from national retailers was the packaging would not allow it to compete with other leading brands. Therefore, to increase the volume of sales, to create a sustainable revenue for the Trust, the brand was re-launched with a more competitive look. This enabled it to finally be accepted as a serious brand that would offer an affordable competitive skincare range from the NHS. with OK! Magazine 2017 as Best New Body Care Product. 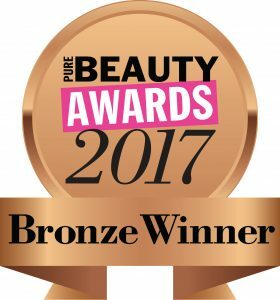 'Bronze' for the Sunflower Hand Cream - Lavender at the Pure Beauty Awards as Best New Natural Product. Our brand is continuing to grow and proving its effectiveness as a natural sunflower moisturiser. Education, Health & Wellbeing is a key focus for this year to raise awareness with the public that 'We Can Do' something to help ourselves, instead of relying on our GP's for a prescription to soothe dry itchy skin symptoms.